This Saturday, December 11th, Old Navy will be having another One Day Wonder event! 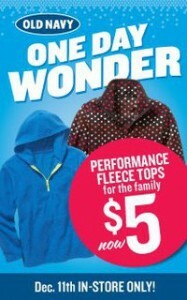 Performance Fleece Tops for the entire family will be just $5! Only select styles will be available while supplies last. It’s an in-store only event and a limit of 5 per customer.